Niagara Falls: Which Side is Better? Because a waterfall such as Niagara Falls spans two different countries it’s natural to ask which side is better. In this case, is the American side or Canadian side better? 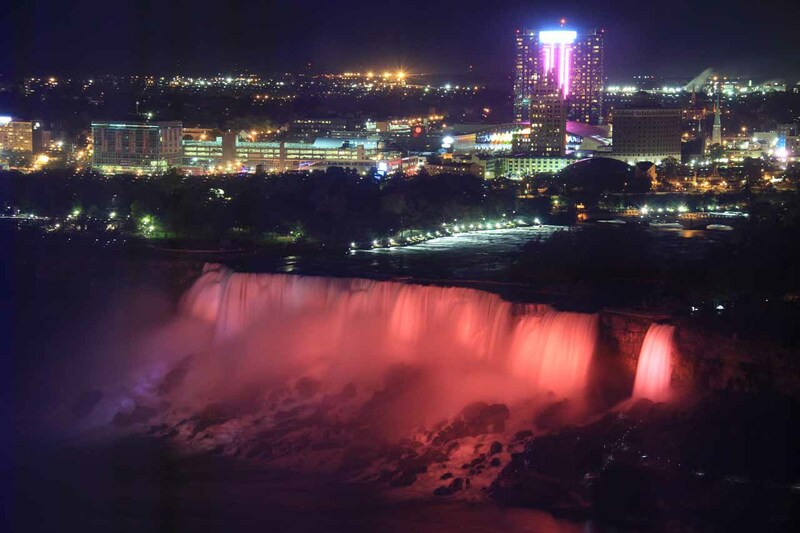 You’ve probably heard that the Canadian side is better. 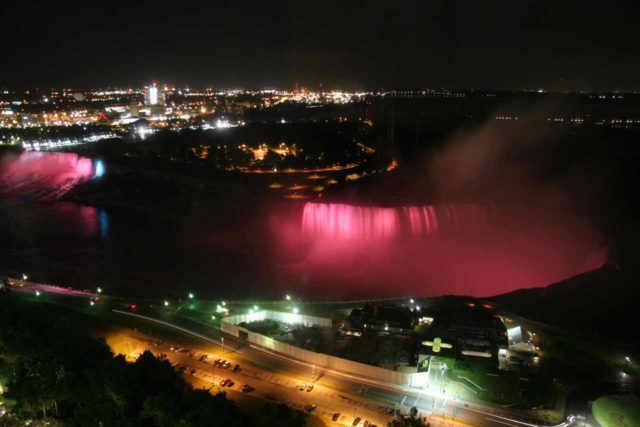 But before you go off jumping to conclusions and spend most of your time on the Canadian side, there are things you should know about both the American and Canadian sides. By considering both sides, this might help you get the most out your experience here. 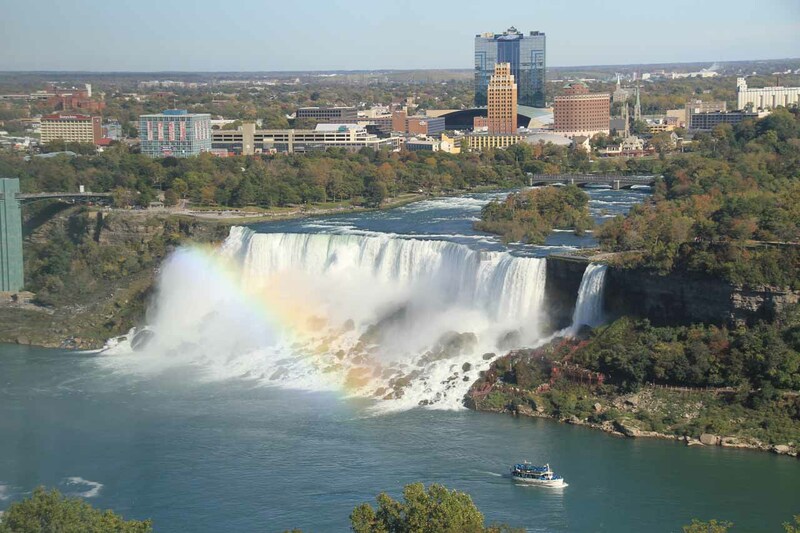 The American side resides in Western New York. 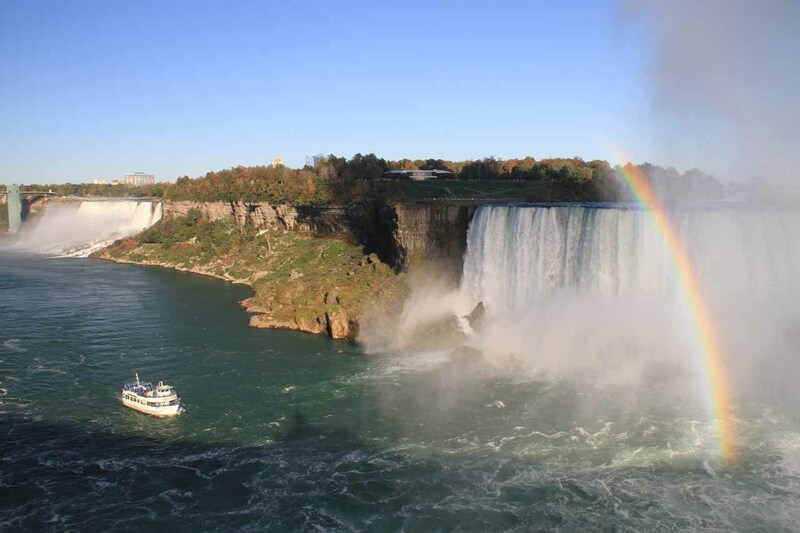 It allows you to get up close to all three components of Niagara Falls – Horseshoe Falls, Bridal Veil Falls, and American Falls. 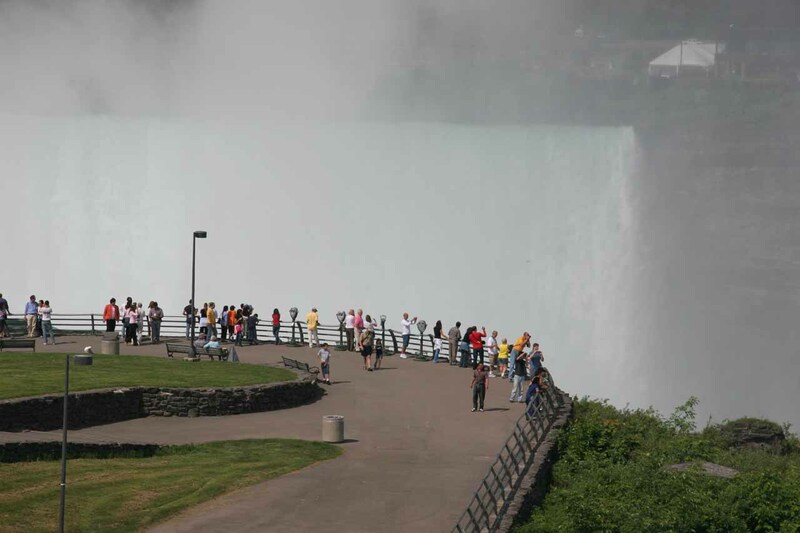 However, unless you go on a paid excursion (not counting admission and parking fees), you only see the falls from the top down or in profile. 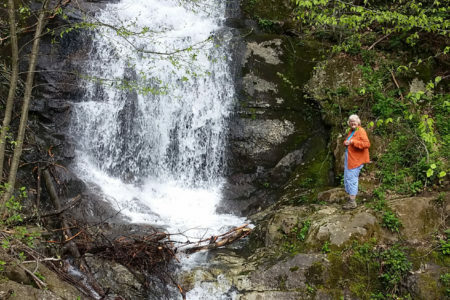 So in that sense, you could find the experience underwhelming if you do not shell out the additional money to go on those excursions. That said, we definitely noticed how much quieter it was on the American side (though it was still busy). We could probably attribute that disparity in visitation to the reputation that Canada has the better side (for reasons we’ll get to further below). 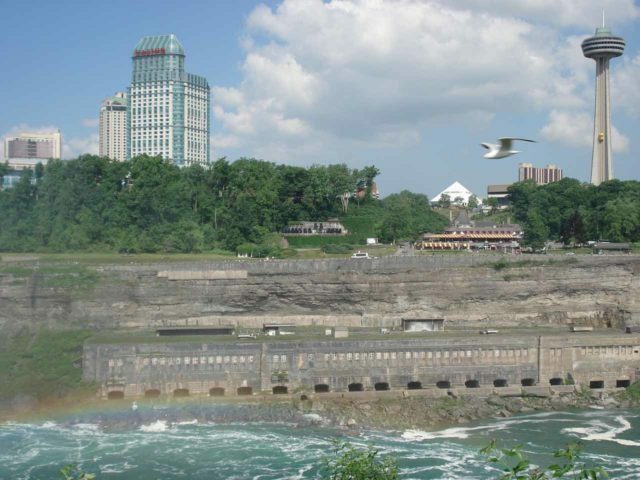 In addition, from the American side, we also saw the impact of Vegas-like developments across the Niagara River on the Canada side. In comparing those developments to the relatively more humble developments on the American side, we felt the American side of the falls seemed more park-like instead of more Vegas-like. 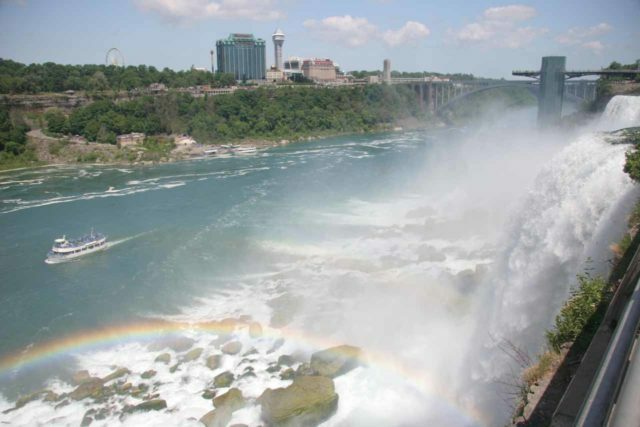 Naturally, in order to get the most of our Niagara Falls experience, we did go on some of those paid excursions. 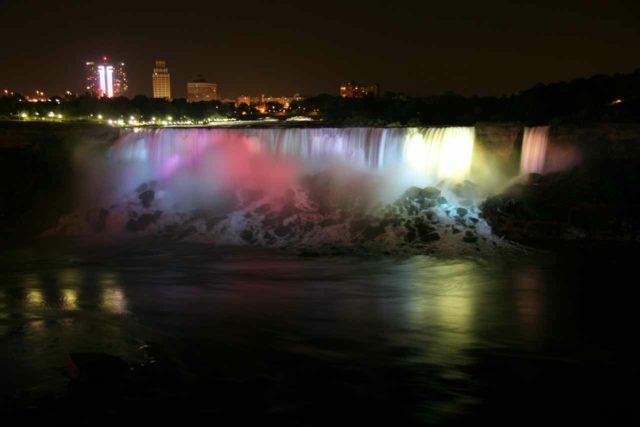 This allowed us to experience the falls in many other ways. 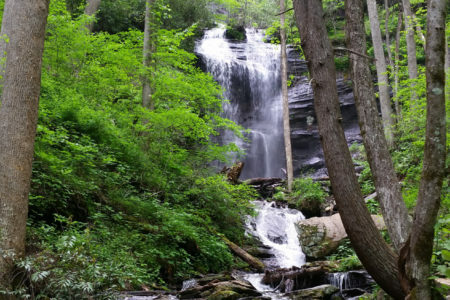 This included getting drenched at the base of Bridal Veil Falls on the Cave of the Winds excursion. 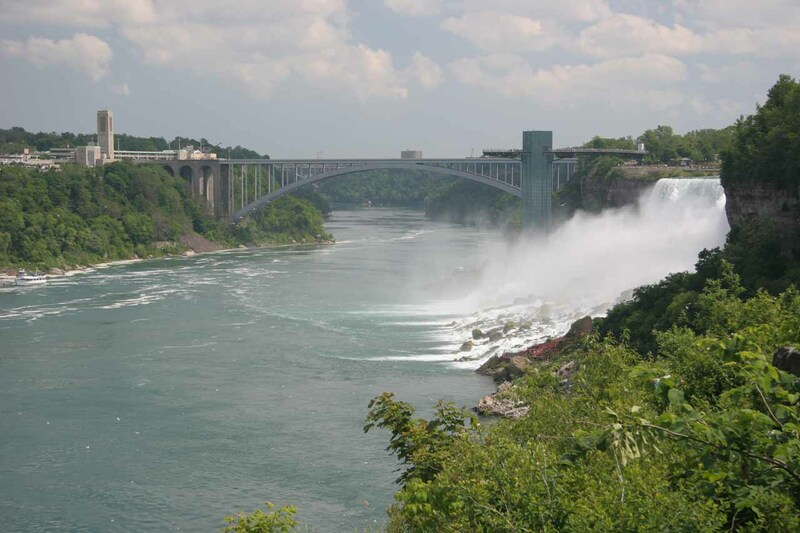 It also included lookout decks looking upstream along the Niagara River towards the mighty Horseshoe Falls. We even got regal views over the Niagara Falls from an observation tower as part of the Maid of the Mist Tour. Furthermore, we noticed some historical artifacts and relics among the walking paths. Among them included a statue of Nikola Tesla on Goat Island. Tesla was credited with refining power transmission technology by leveraging alternating current (AC) for commercial use, especially at Niagara Falls. We also spotted a relic of an old power station across from the Cave of the Winds towards the Canadian banks of the Niagara River. 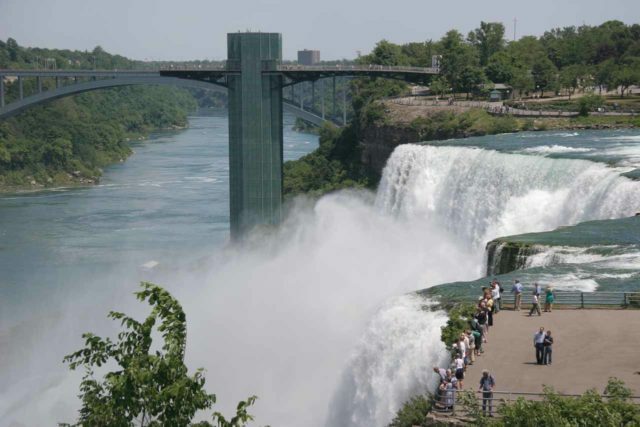 Below, we show some more photos of what we have seen and experienced on the American side without going a paid excursion. 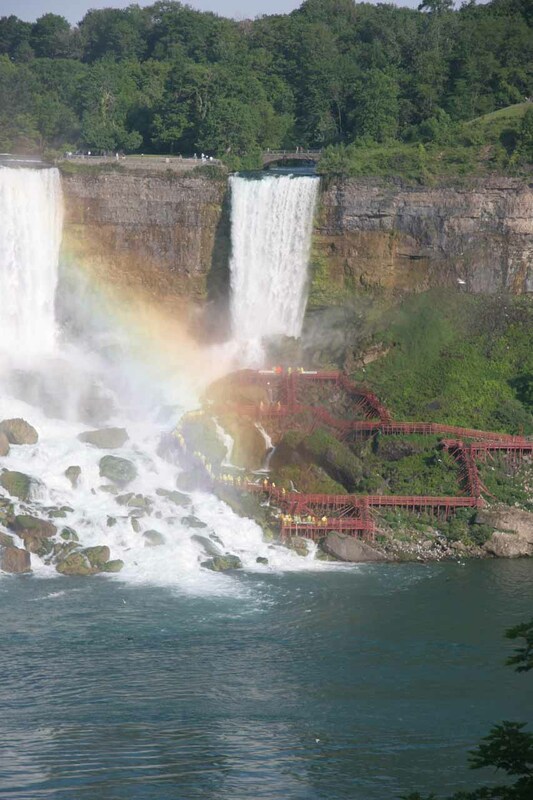 View towards the Rainbow Bridge and American Falls. Notice the observation tower in the distance. 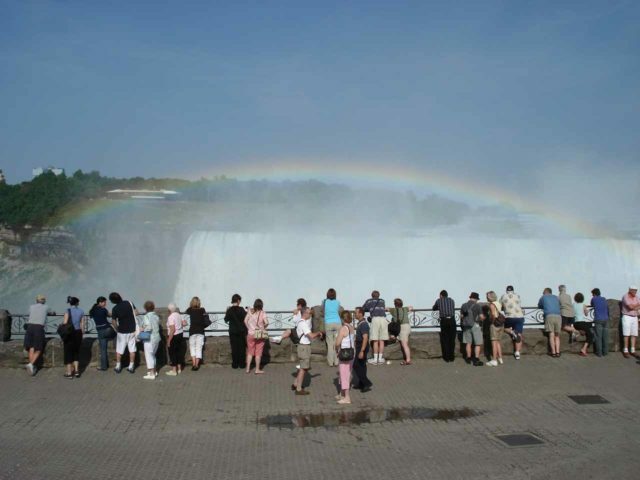 As mentioned earlier, we have a separate write-up describing the paid excursions that we’re aware of around Niagara Falls. 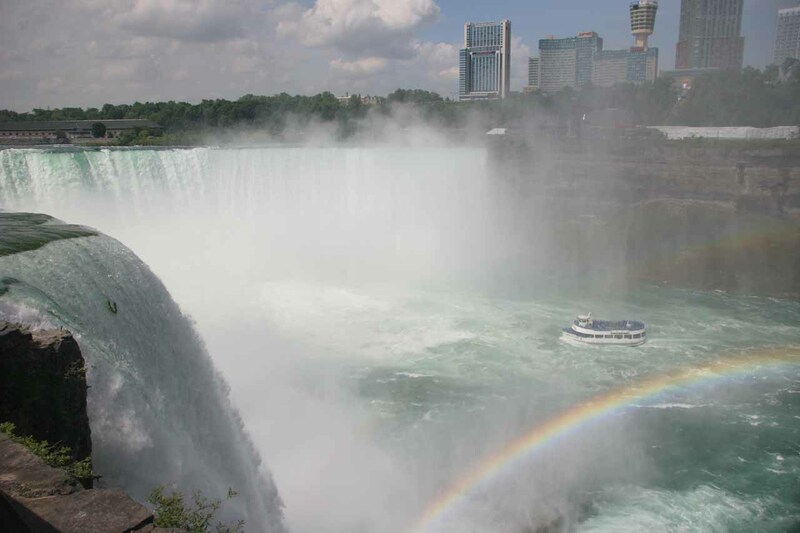 The Canadian side is where you get gorgeous panoramas of both the American Falls and the mighty Horseshoe Falls. 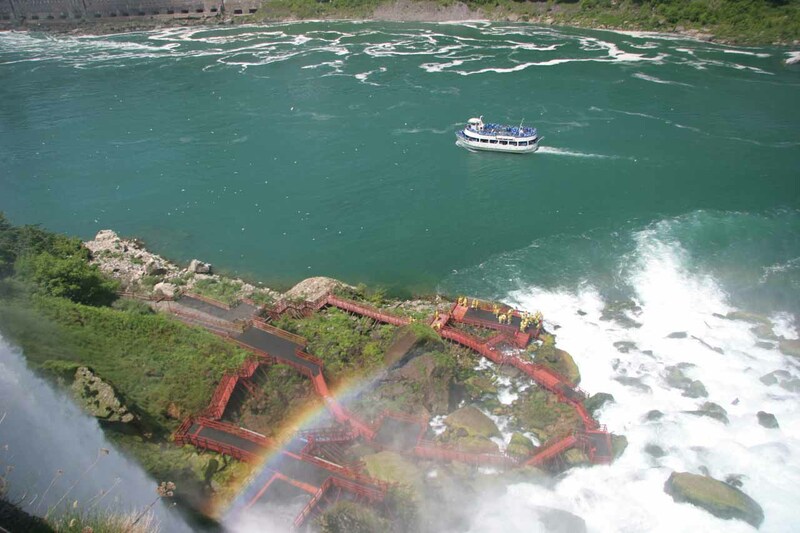 It’s definitely the more glamorous side of Niagara Falls. 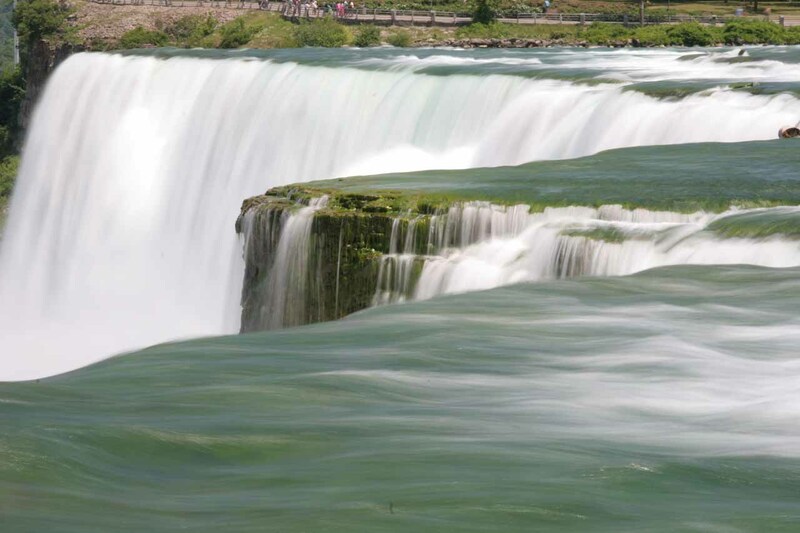 While you can’t get right up to the American and Bridal Veil Falls, you can get right up to the brink of Horseshoe Falls. 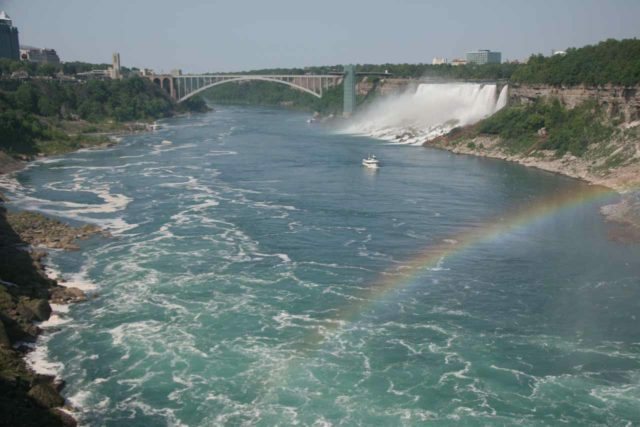 Besides, many people find it sufficient to feel the raw power of the Niagara River from only this vantage point without needing to get close to other components of Niagara Falls. 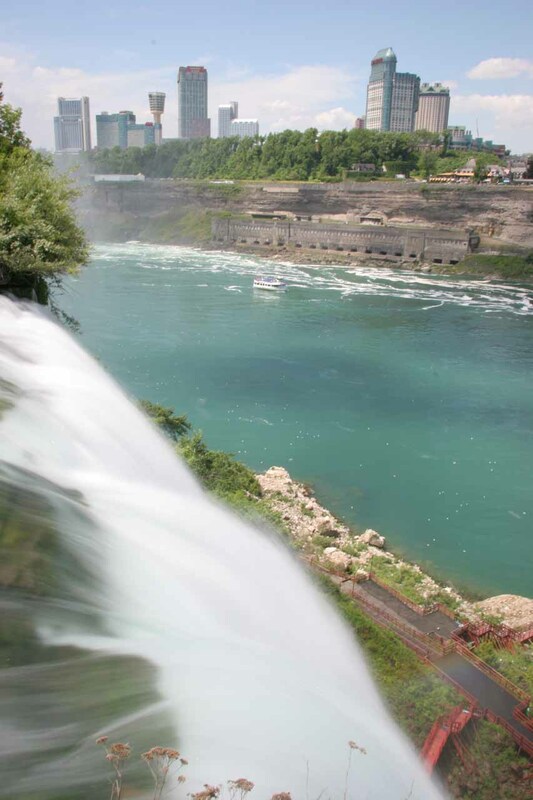 You can even get direct views of the mighty Horseshoe Falls from the established lookouts along the Niagara River. Of course, we paid a fairly hefty price for the privilege of being so well-situated at the falls. After all, accommodations, restaurants, and parking definitely costed more on the Canadian side as opposed to the American side. 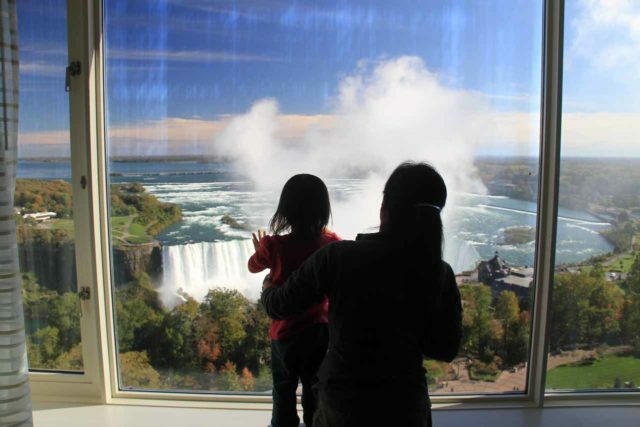 If you’ve had enough of Niagara Falls, there were numerous casinos and family activities both around the waterfall as well as further away downtown. 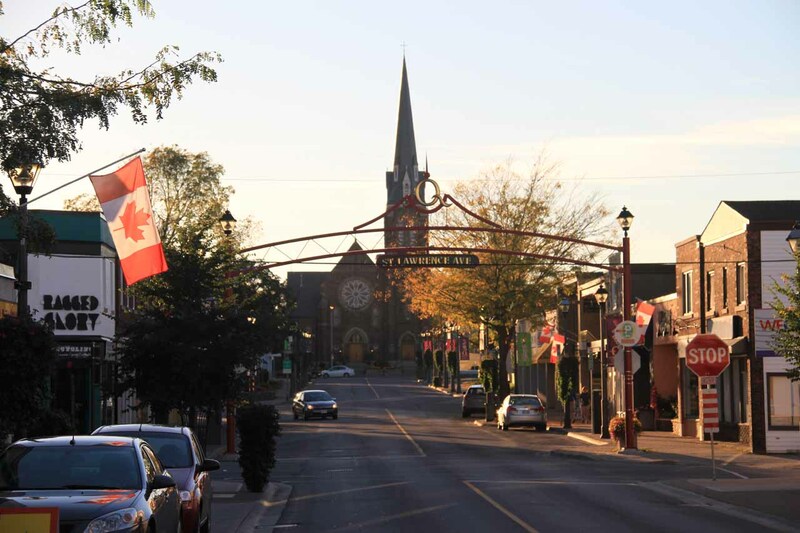 We even explored the historic Queen Street District, which was charming, relatively quiet, and provided a little bit of a nice culinary experience. That said, the Vegas-like atmosphere of the city of Niagara Falls did make the Canadian side of the waterfall seem more like an urban side attraction. In fact, most of Niagara Falls’ natural beauty had pretty much gone away on the Canadian side. 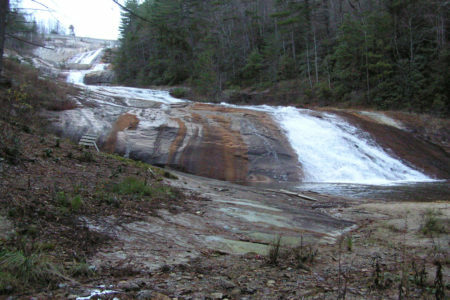 The last remaining vestiges of Nature required going well downstream and out of sight of the waterfalls themselves. 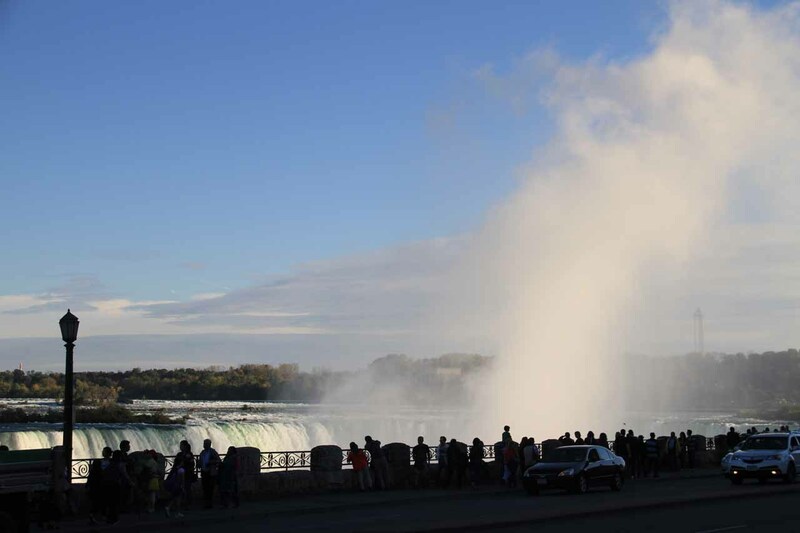 Below are some of the photos we took from the Canada side (excluding the paid excursions, which we have a separate writeup for). 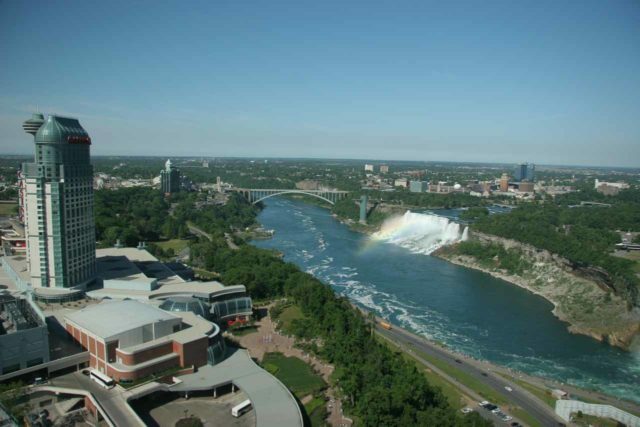 Exclusive to the Canadian side is the ability to stay in a hotel with a commanding view of Niagara Falls. 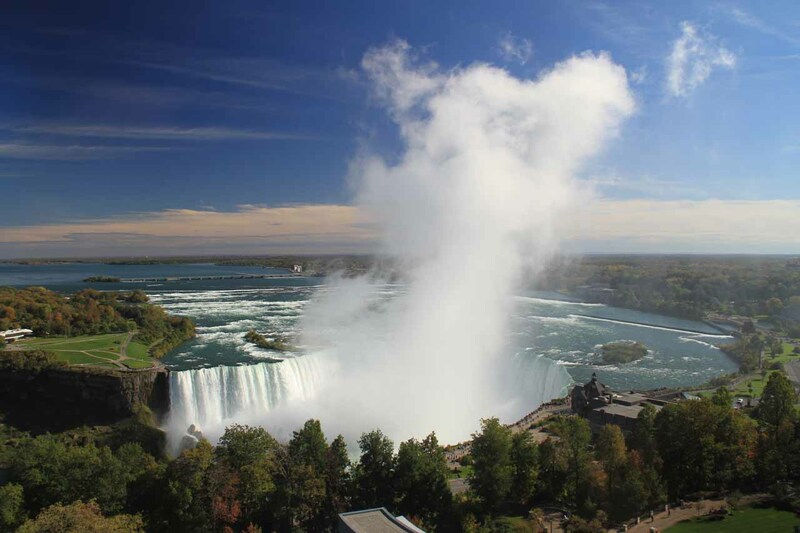 Looking down at the American Falls from our room. 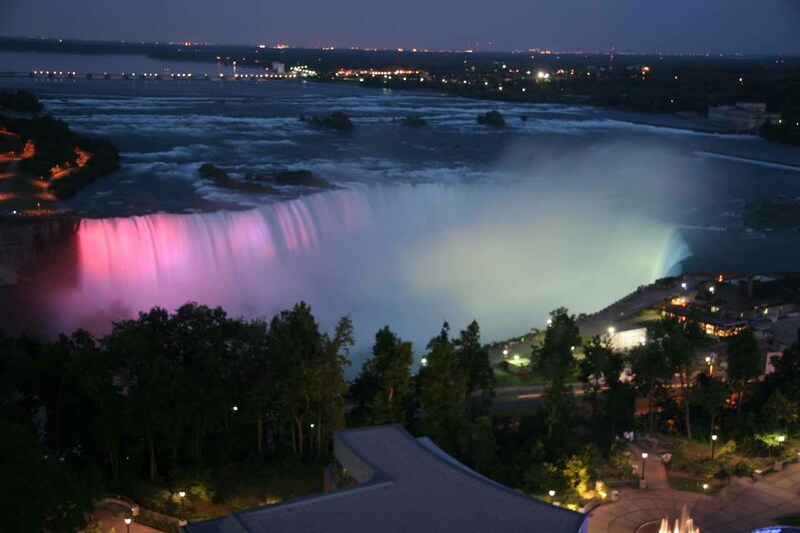 Context of the lit up Horseshoe Falls from our room. 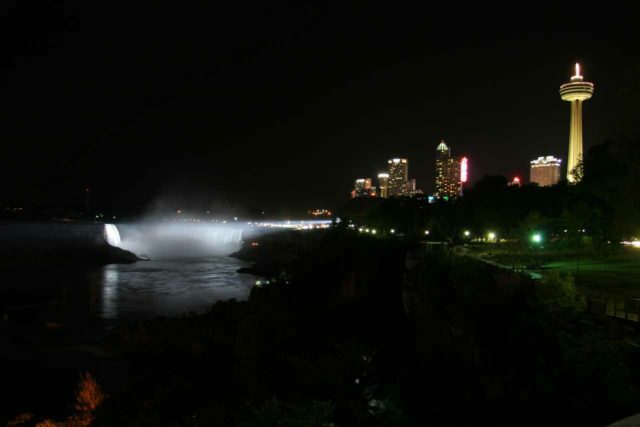 Also best seen from the Canadian side is the Niagara Falls floodlit at night. This usually occurs from the onset of darkness until midnight. They tend to change colors seemingly in random order so you can easily be mesmerized staring at what combination of colors are going to be next. 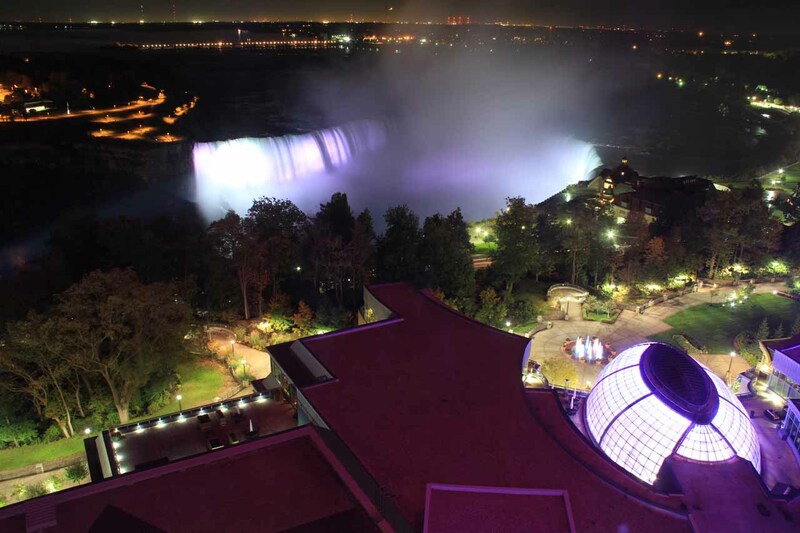 Context of the lit up Horseshoe Falls fronted by some building lights from our hotel room. 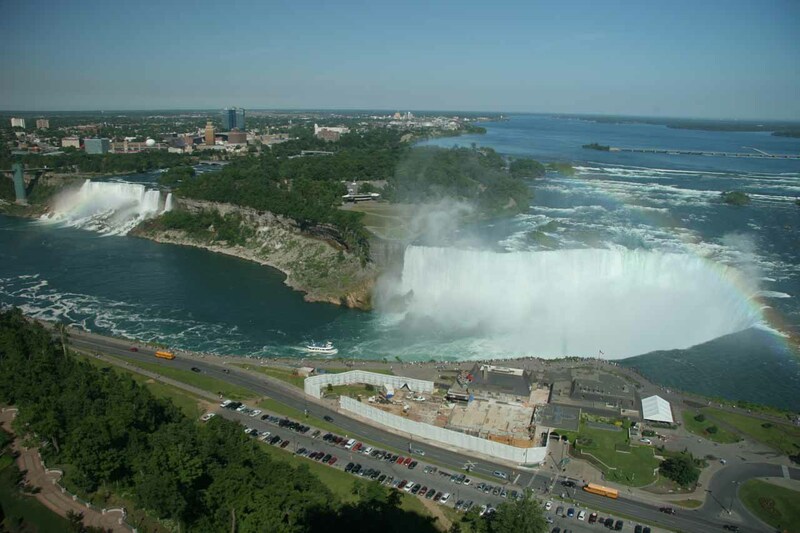 Looking back at Horseshoe Falls and the high rises of the Canadian side. 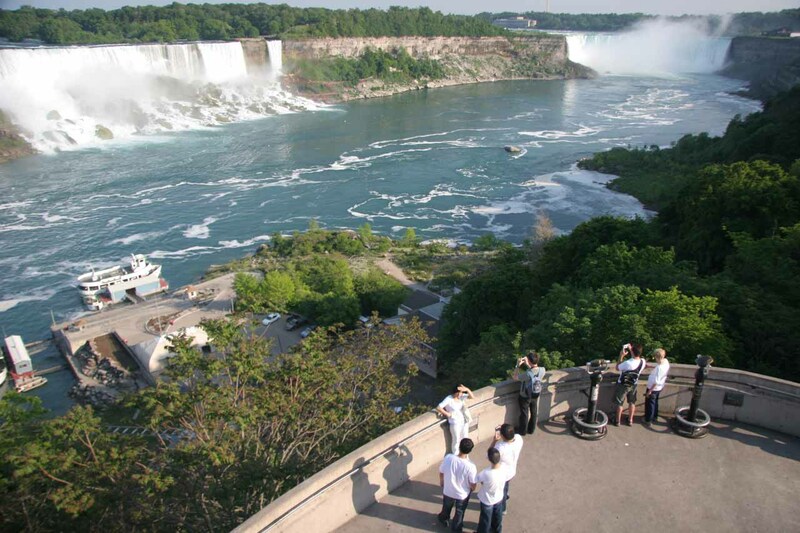 In our opinion, the Canadian side is better in terms of what you could do without paying extra for the excursions. We also loved staying at a hotel with amazing views of the falls. 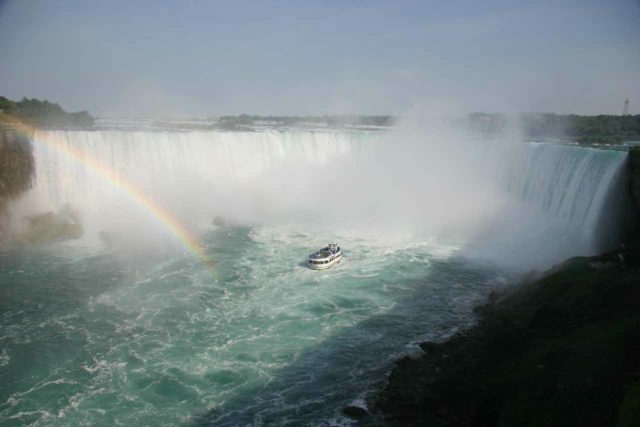 That allowed us to enjoy the falls in the comfort and privacy of our room. However, I’d argue that it’s an incomplete experience if you exclusively visit only one side. That’s because in general, Canada has the panoramic views while America gets you up close and personal with the waterfalls (including American and Bridal Veil Falls). 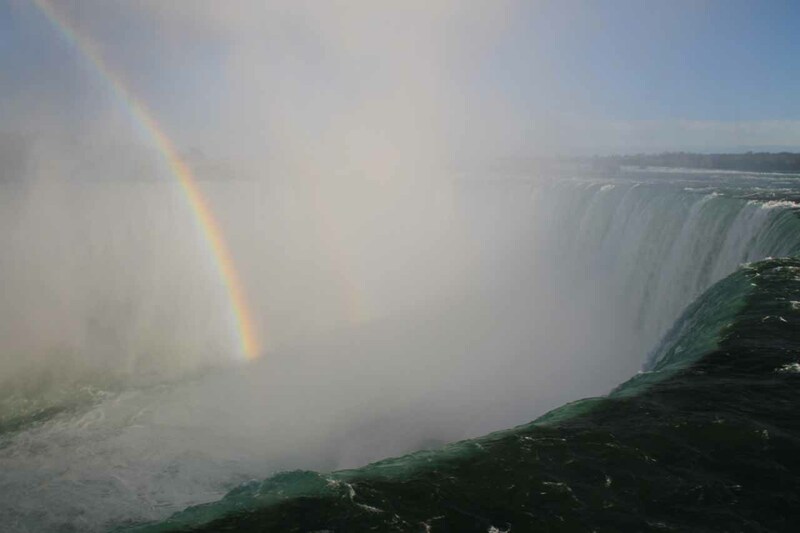 And both sides gets you up close to the Horseshoe Falls. 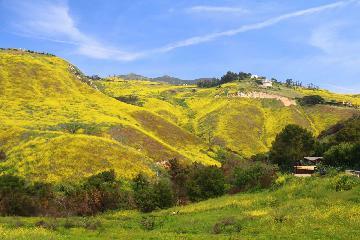 Of course, you should consider more than just the visual experience when planning a visit here. Indeed, we learned from our experiences that the American side was quieter and relatively less commercialized than its Canadian neighbor. 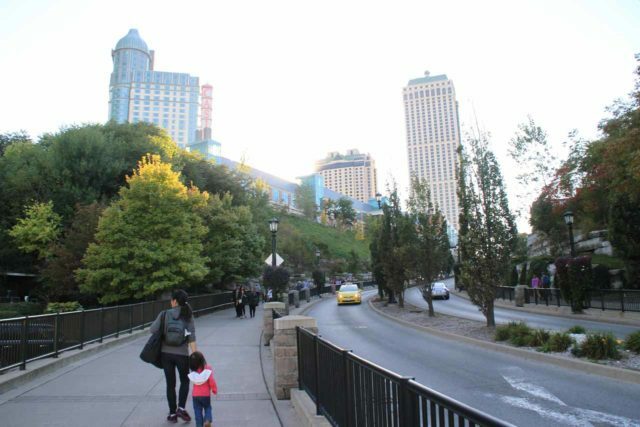 It also felt as if the Canadian side possessed more of a Frankenstein-like hybrid of Las Vegas and waterfall world wonder given its high rise casinos, intense foot traffic, and high prices. So with both sides, you have to take the good with the bad. Either way, just come with an open mind and you’ll likely not set yourself up for disappointment. In any case, it’s pretty convenient and straight forward to see both sides. So why not check them out? What do you have to lose? With all the textual and visual information provided here, we hope you can decide for yourself how to plan your trip (regardless of which side you might think is better).